Valentines for Soldiers is a combination bake sale, care package creation frenzy and fundraiser for veteran support organizations. HOUSTON, January 16, 2012 – It may have started small four years ago as a gathering around a kitchen table, but Valentines for Soldiers this year is expected to attract hundreds of volunteers and raise thousands of dollars for veteran support organizations. Volunteers will pack Saint Arnold Brewing Co. (www.saintarnold.com), the oldest craft brewery in Texas, stuff boxes with packaged goods and construct homemade Valentines cards out of construction paper, glitter, glue and stickers. What: Valentines for Soldiers, which is a combination bake sale, care package creation frenzy and fundraiser for veteran support organizations. When: Monday, January 21, from 6 p.m. to 9 p.m.
Why: To send thanks and appreciation to our troops and veterans, and to raise money to help support them as they transition to civilian life. Who: Bakers, bloggers , beer lovers and hundreds of big-hearted and sweet-toothed Houstonians. Also, Nishta Mehra, an award-winning Houston food blogger (http://bluejeangourmet.com/), who was the mastermind behind Valentines for Soldiers, will be available for comment. The cost for participating is $10. Saint Arnold Brewing is donating $5 from each entry ticket. 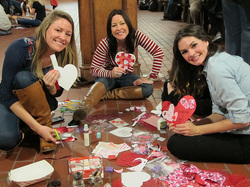 Last year, Valentine’s for Soldiers attracted 350 volunteers, raising more than $4,000. Approximately $1,000 covered the cost of shipping 75 boxes to U.S. military personnel serving overseas. The rest – $3,336 – was donated to the Wounded Warrior Project. Food Trucks H-Town strEATs and Koagie Hots will also be onsite and will donate a portion of proceeds. Saint Arnold Brewing’s 13 brews are made and sold by the company’s staff of 45 dedicated employees. Ranked 43rd on the Brewers Association list of top craft breweries, Saint Arnold was listed by USA Today as one of the “10 great places to see what’s brewing in beer,” and Smart Meetings magazine named it among the “Top 5 breweries to host an event.” Saint Arnold is located at 2000 Lyons Avenue and its brewery tour and tasting is offered every weekday at 3:00 P.M. and Saturdays starting at 11 A.M. For more information on Saint Arnold’s five year-round and five seasonal beers as well as root beer, log on to www.saintarnold.com.